The Summer is official over, so that means it is now time to reach into your closet to grab your trench coats and get ready to go… in a stylish and fashionable way! Trench coats are one of the hottest trends for Fall 2009. Forget about wearing the trench coats only on the stormy and rainy days, this can be your everyday coat. A multitude of colors and military inspired coats remain on the cutting edge this season for trench coats; paired with jeans, a skirts, or dress, every outfit will look equally fabulous. Let’s not forget about the classic trench, this look is timeless! 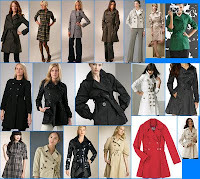 Whether you go trendy or practical, a trench is a flattering option for almost every body type. So true!!! I just bought a trench to wear flooowing over my dress for this weather. I love Posh!! !